This post is now part of the Festival of Postcards, coordinated by Evelyn at her blog, A Canadian Family. The theme of the Festival is “White.” Visit the festival at Festival of Postcards (6th Ed.) – White! So Antarctic and Arctic animals fascinated me. Whether you believe in Mother Nature, Father God or something else altogether, the fact that creatures can live in the conditions encountered near our Poles is completely phenomenal. I mean, would you care for your unborn baby in temperatures of around minus 60 degrees Celsius (minus 80 Fahrenheit) with winds of over 100 miles per hour. Emperor Penguins do, with no trouble at all! These awesome birds have no nest, no homes – just a warm brood patch to tuck their eggs into as they balance it on their feet. And what’s more – it’s the dads who do this. Unfortunately I don’t have a postcard of an Emperor Penguin, but you can check them out here: Antarctic Connection: Wildlife of Antarctica. I do however have Adelie penguins! So from the largest penguin of Antarctica, we go to the smallest. These ones are from a group that nests at Cape Royds, Ross Island which at latitude 77 South, is the southernmost penguin colony in the world. These little Adelies have a different strategy that the big Emperors. The Adelie Penguin raises its chicks entirely during the short summer season, so that the young penguins are ready to leave their parents before McMurdo Sound ices over for the winter. Beginning in September and ending in March, the journey across ice and land to the nesting site must be made, a mate found, nest built or repaired, eggs laid, incubated and hatched and a young chick prepared for a life at sea. It’s a big challenge but the Adelie Penguins complete it. The babies grow very quickly in their first months and it’s quite a struggle for the parents to keep feeding them. After about a month the chicks are left together with other chicks in a penguin crèche (yes really!) and both parents go out to sea to find food. The chicks grow larger than their parents, but with grey downy feathers instead of their adult colourings. 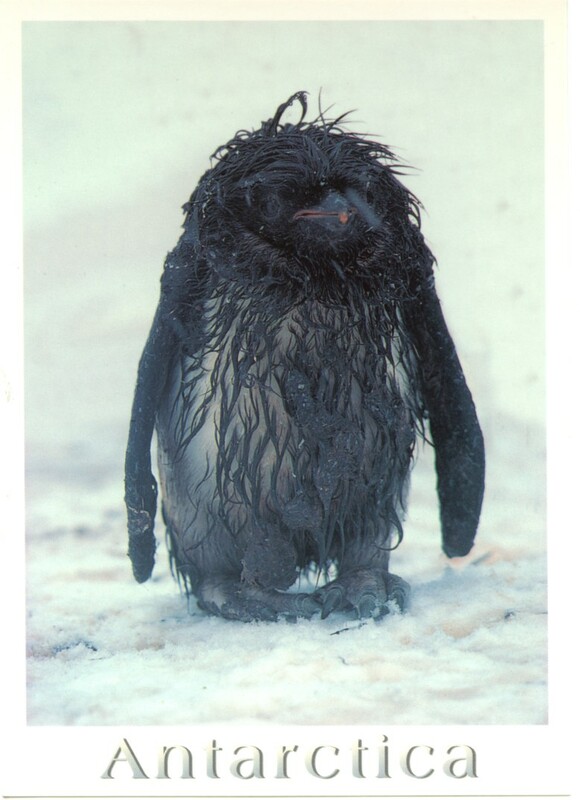 Eventually the chicks shed the grey fluff and prepare for life in the ocean on the ice packs. They live at sea on the ice during winter, in a white white world. 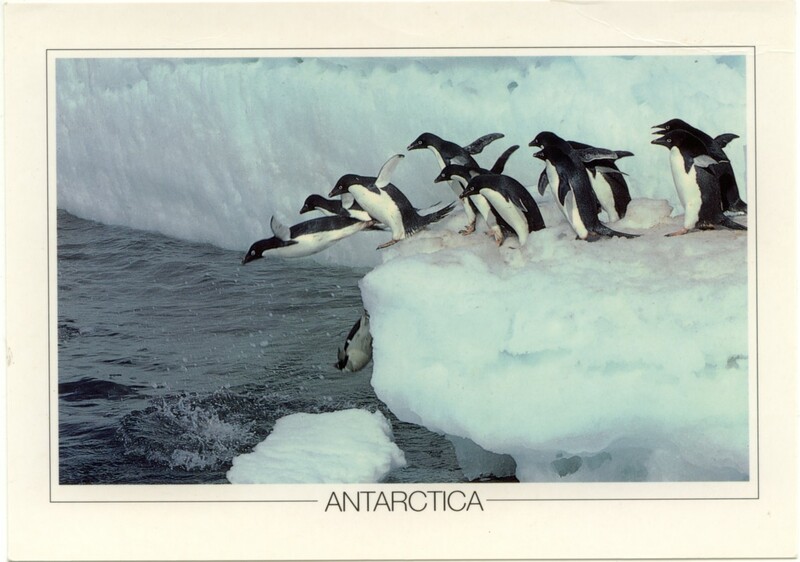 These Adelie Penguin postcards – and some other Antarctic penguins – have been with me for a long while. In fact I’d forgotten that I had them, until I sorted my stationery when I started Postcrossing recently. So I don’t know when or where they are from, just that I likely brought them myself, as they are not written or stamped. Now, from being as far in the southern whiteness as we can go, we’ll head north to the tundra and ice packs of the Arctic Circle for our next creature. One of my favourite animals is the Polar Bear, Ursus maritimus or the “sea bear.” Polar bear spend as much time on the ice as on land, and are the only ‘marine’ bear. Polar bears are considered to be a threatened species by the USA. The state of Alaska is one of the areas that polar bears inhabit, along with Canada, Russia, Norway and Greenland (which is part of Denmark.) An estimated 60% of the polar bear population is found in Canada. 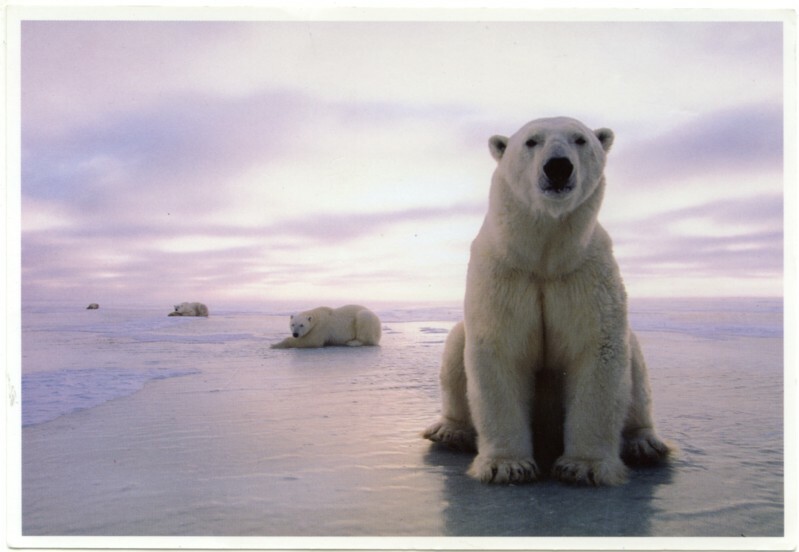 Polar bear populations have been affected by the decline in sea ice. This is thought to be caused by ‘global warming.’ Polar bears are reliant on the ice for their hunting and breeding so a decline in ice negatively affects population numbers. There may also be more risk of polar bear/human encounters as polar bears are driven ashore in the search for food as there is less sea ice. What food could there be out on the ice you wonder? Polar Bears eat seals mostly, but will scavenge anything such as dead whales and walruses, and have been known to kill young ones. When their favourite seals are unavailable the bears will eat any kind of meat such as birds, fish, eggs, small land creatures and also sea weed and berries. They have been reduced to eating human garbage, which calls problems for bears and humans alike. I find it completely amazing that a creature like a bear lives almost entirely on the ice, and is able to survive taking a polar dip in the ocean. Its extra-ordinary ability to survive in extreme conditions is in part due to the deep layer of blubber. (The rest of us would call it fat, and would not be quite so proud to bear an 11cm (4.5 inches) layer of it under our skin!) This blubber is topped with a layer of dense fur of different lengths including a thick layer of under fur. Polar bear fur is not actually white (What? 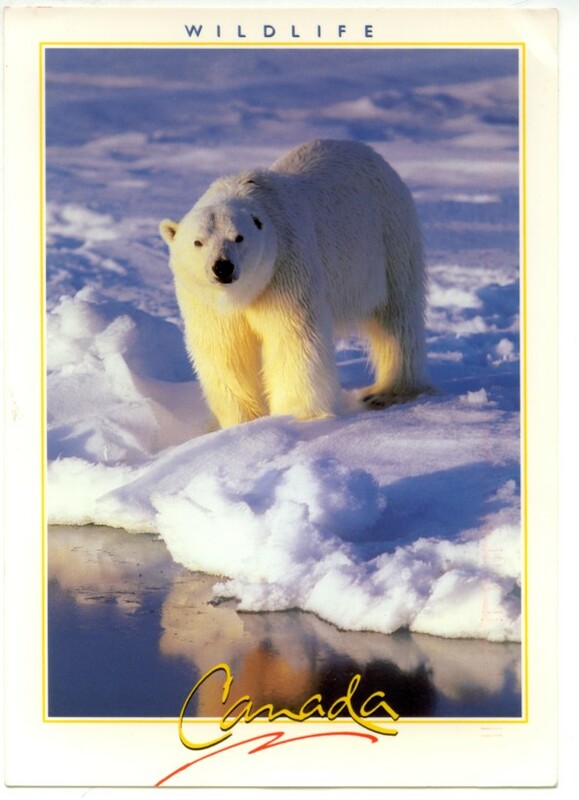 Out they go – no polar bears in this Festival of Postcards then!!!) The fur is transparent – that is, no colour at all – and hollow. And what’s more, polar bear skin is black. Both these characteristics are also mechanisms that help the polar bear to gain and retain heat. As you are probably aware from personal experience, dark surfaces absorb more heat – thus when there is sun in the polar bears’ habitat its skin will absorb the warm from the sun. The hollow hairs trap warm air, giving the polar bear another layer of protection. A polar bear apparently appears white to our human eye due to the fur reflecting the white light of its snow and ice covered surroundings. The card below is a private swap courtesy of SibCat at Postcrossing who saw that I would like a polar bear card and offered to send me one. Such is the kindness of Postcrossers! He received a kiwi in return, of course! 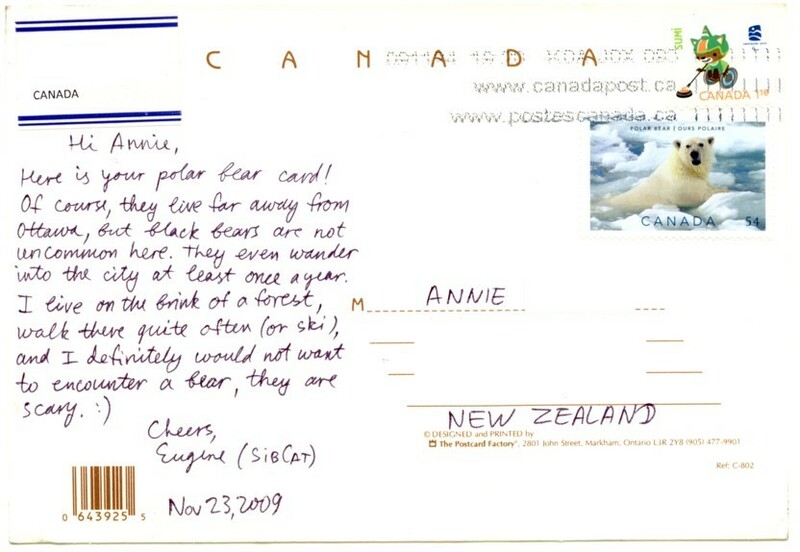 I also really appreciate the polar bear stamp. These Canadian Polar Bears in Churchill, Manitoba, have just spent several hours play-fighting. Polar bears are insulated from the cold by their black hide and think layer of blubber. Vigorous activity can make them overheat, and the bears need a break from their games to cool down. Spacing themselves out evenly across the ice-floe means that if one of them starts to move around again, the others have enough time to respond. So even polar bears have playtime!